Top of the CapitaLand building in Singapore’s central business district (CBD); taken September 2018. CapitaLand’s shares may fall when they resume trade on Tuesday after announcing a proposal to acquire Ascendas-Singbridge from Singapore’s state-owned investment fund Temasek in a deal with an enterprise value of S$11 billion. Under the agreement, Temasek will effectively receive S$6.0 billion, with 50 percent in cash and 50 percent in new CapitaLand shares priced at S$3.50 a share, a premium of 11.3 percent over the one-month volume weighted average price of S$3.1447, the filing said. The shares ended Friday at S$3.27. 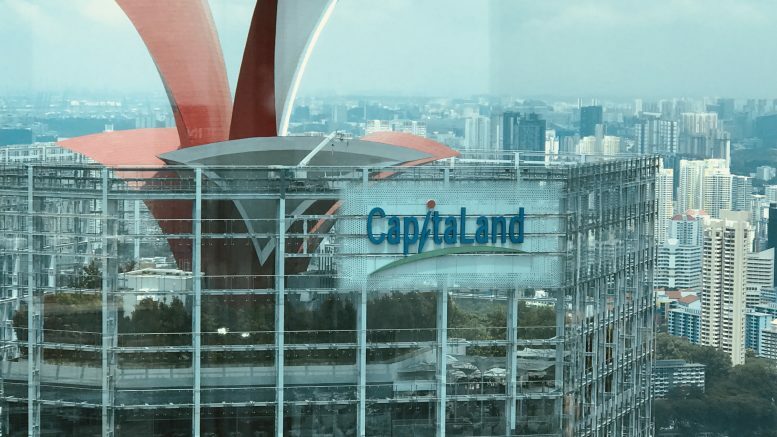 “We think investors may take issue with the fact that CapitaLand is issuing new shares at a discount to NAV [net asset value] to acquire ASB that is valued at NAV,” Nomura said in a note on Tuesday. But it added that over the next one to two years, the deal could create catalysts for the stock, including asset injections into the eight REITs CapitaLand would manage. It could also spur new REIT listings, the potential for some REITs to be merged and large-scale master developer projects, such as the Kampong Bugis district redevelopment, it said. For merging REITs, the candidates include hospitality focused Ascott Residence Trust and Ascendas Hospitality Trust, Nomura said. Nomura rates CapitaLand at Buy with S$4.20 target price.